Noodle time again! Though it was not anyone’s birthday this week, I wanted to make Pancit Guisado, a Filipino stir-fry noodle dish with vegetables, seafood, and meat. We’ve been continuing to enjoy the winter squashes that are available, especially Spaghetti Squash, which are in it’s peak season from fall to winter. I’ve seen a lot of pasta applications to Spaghetti Squash, but I think that it could also be adapted to any noodle dish or beyond. 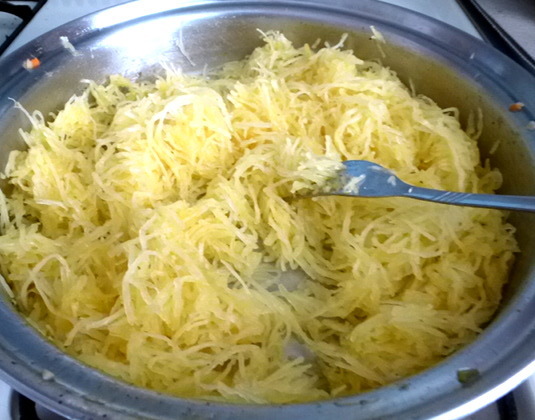 What better way to satisfy my Pancit craving and my fascination with tweaking dishes like this Filipino favorite than with the tasty, nutrition-packed and unique Spaghetti Squash? There are many ways of cooking spaghetti squash. This time I cut it in half (carefully) and cleaned it up by scooping out the pulp and seeds. Then I spritzed it with some high-smoke point oil on the flesh and sprinkled with salt & pepper. After that, I put it flesh side down in a baking pan, poured in a cup of water and baked it at 375 degrees F for about 40 minutes until the skin is soft and knife-tender. Then turned off the oven and left the squash to cool down in the oven, which gave me time to go on a walk with my dog 🙂 Once it has cooled a bit, scrape a fork lengthwise on the squash half and the noodles magically appear! 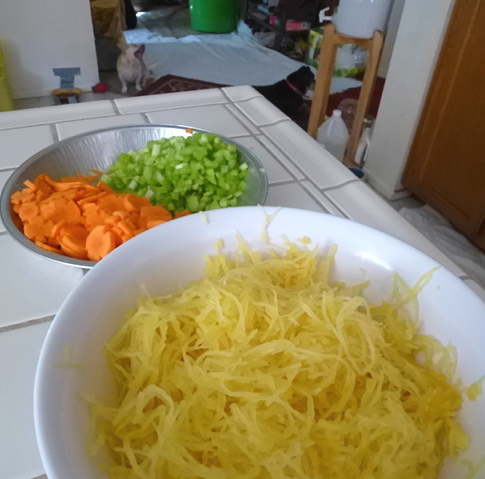 Here are the spaghetti squash noodles and some veggies. Wait, there’s something funny going on in the background! Zooming into the picture, we see Keiko the Chihuahua-mix with her mouth open! I love capturing things like this! I think she was eating at the time. Haha. I was cracking up when I was uploading this picture! Here are the shaved Brussels sprouts. I didn’t have cabbage so I used sprouts. By the way, these taste great raw in a salad too! 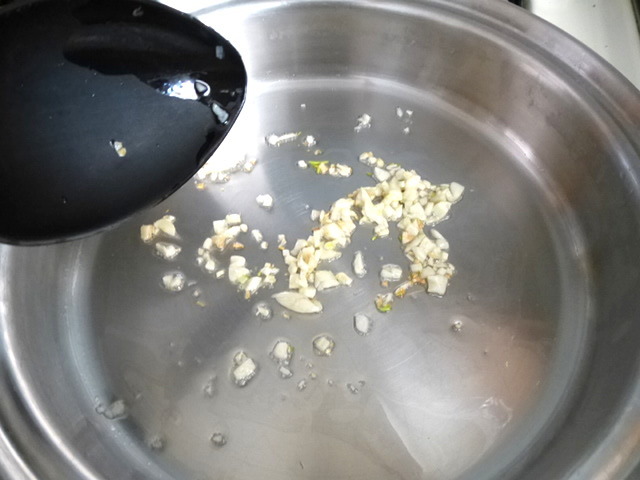 Sautéing the garlic in some oil until just starting to brown. I like browning garlic because it gives another dimension of flavor that goes well in pancit noodles. Then add the onion, boullion, and salt & pepper. Cook until onions are soft. Deglazing the pan with some water. At this point, you could add some cubed meat like chicken or pork and stir-fry it. But, I was making a quick lunch that was more veggie-heavy. Sliced Chinese sausage, fish cake balls, or even mini scallops are other proteins you can add. I added the shrimp later. Added the celery and carrots and stir-fried that for a few minutes to soften them up and release some flavors, but still have some crunch. You can add some water if you feel it is too dry at this point. 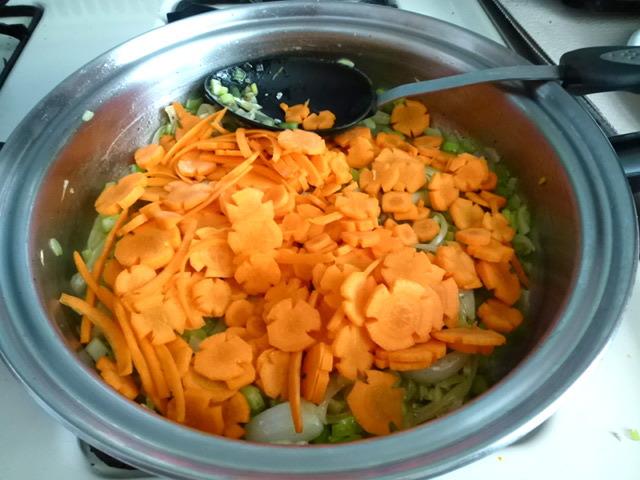 Once they have softened just a little bit, take the veggies out of the pan and set aside. Other things you can add to the stir-fry is sliced shiitake mushrooms, snow peas or even some bell peppers. Then it’s time to stir-fry the squash noodles for a few minutes on its own to release their flavors, soften a little, and pick up some of the flavors in the pan. Then add the soy sauce, patis (fish sauce), water if needed, and cabbage or Brussels sprouts. Stir-fry for a few more minutes. Season with salt & pepper to taste, if needed. Then turn off the heat and add the chopped celery leaves. Mix. Add the cooked shrimp and scallions. Eat with a squeeze of lemon or calamansi (Filipino citrus similar to kumquat). This step is crucial. Even if you don’t like lemon, you need to do this. It brings all of the flavors together and brightens up the dish, just as lemon should do. Heat some oil on medium heat, add the garlic and cook until starting to brown. 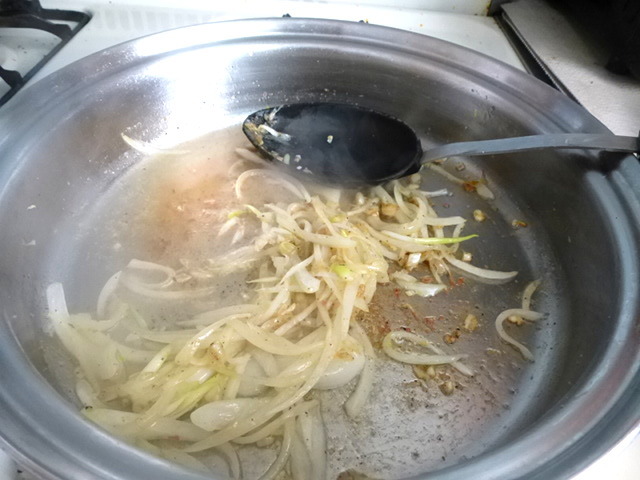 Add the onion and salt & pepper to taste and cook for a couple of minutes until onions are soft. Mix in the boullion and cook for a couple minutes longer. Add a couple of tablespoons of hot water to deglaze the pan. Add the chopped celery ribs (set aside the leaves) and chopped carrots and stir-fry for a couple minutes until the vegetables have softened slightly, but still have some crunch. Take the vegetables out of the pan and place in a container to set a side. Put a dash of oil in the pan and add the spaghetti squash. Season with salt & pepper to taste. Stir-fry the noodles for about 5 minutes to release the squash flavor. 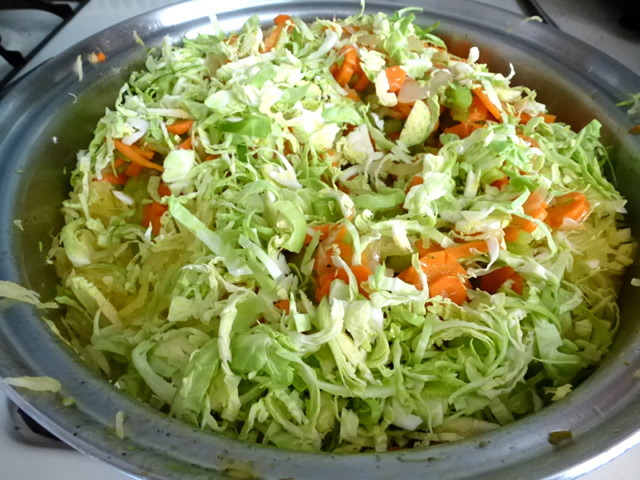 Mix in the cooked vegetables, cabbage, soy sauce and fish sauce with the noodles and stir fry for a couple of minutes. Turn off the heat and mix in 2/3 of the scallions and the cooked shrimp. Garnish with the remaining scallions. 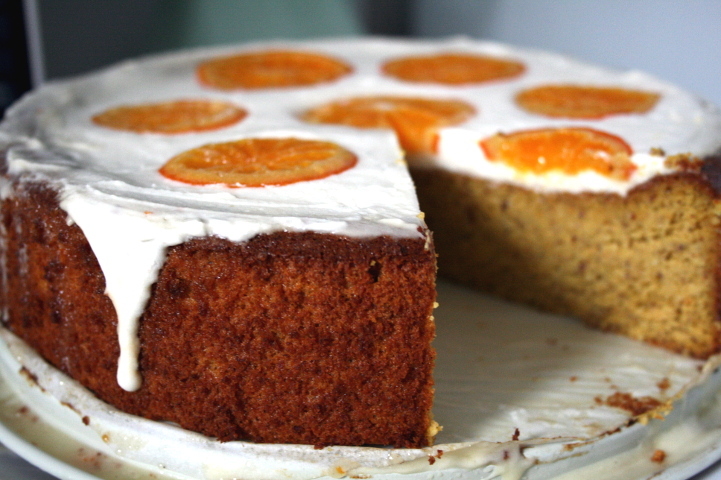 Enjoy with a squeeze of calamansi or lemon! This entry was posted in Cooking, Food, Gluten-Free, Holidays, Recipes, Snacks and tagged Brussels sprout, Chihuahua, Chow mein, Filipino, Noodle, pancit, shrimp, Soy sauce, Spaghetti Squash, stir-fry, vegetables. Bookmark the permalink. I love spaghetti squash. I haven’t used it in years. I think I’ll be trying this out soon. Thanks for visiting! Sounds awesome! Once everything is prepped, it doesn’t take long to cook! This sounds and looks so delicious. Keiko sure is a cutie!! This looks delicious. I like how flexible your recipe is, especially on the subject of proteins. Also, your dog is super cute!